On September 15, 2017 Apple started taking pre-orders for their new iPhone 8 and iPhone 8 Plus. This year however Apple has decided to offer the SIM-Free model of iPhone 8 and iPhone 8 Plus immediately rather than weeks or months after they started selling the phones for AT&T, Verizon, T-Mobile, and Sprint. For those of you who are not familiar with the SIM-Free iPhone option, these models are unlocked and compatible with all four major networks in the US including AT&T, Verizon, T-Mobile and Sprint. There are no contracts, you’ll pay the full price of the iPhone and for the iPhone 8 or iPhone 8 Plus that will set you back between $699 and $949 depending on the iPhone model and storage capacity you use. The SIM-Free iPhone is only available from apple.com or your local Apple retail store. The SIM-Free iPhone 8 and iPhone 8 Plus are also compatible with numerous prepaid wireless networks including but not limited to Straight Talk, Net 10 Wireless, Total Wireless, Tracfone, Cricket, MetroPCS, Simple Mobile, AT&T Prepaid, Verizon Prepaid, and others. 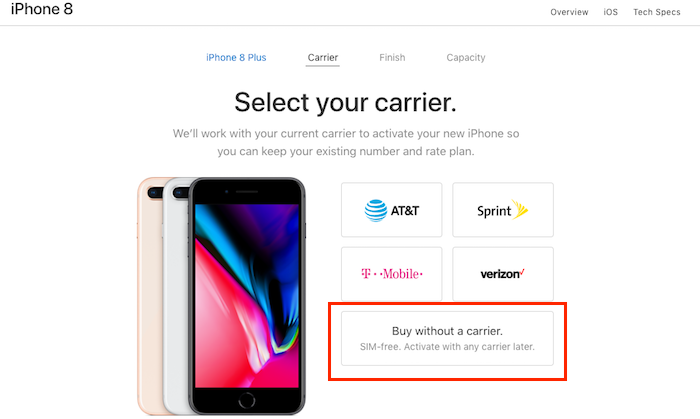 The SIM-Free iPhone 8 and iPhone 8 Plus are compatible with both the CDMA network technologies used by Verizon and Sprint as well as the LTE technology used by AT&T, Verizon, T-Mobile and Sprint. The SIM-free iPhone 8 is model A1863 and the SIM-free iPhone 8 Plus is model A1864. The SIM-free iPhone models are the same iPhones that they sell to Sprint and Verizon customers. AT&T and T-Mobile customers recevieve the iPhone 8 Model A1905 and iPhone 8 Plus model A1897. These models are identical to the other models except they do not support the CDMA network technologies uses by Verizon and Sprint. If you are really interested in the technical details, the A1883 and A1864 support TD-SCDMA 1900 (F), 2000 (A) and CDMA EV-DO Rev. A (800, 1900, 2100 MHz) radio technologies while the A1905 and A1897 do not. I bought my iPhone 5s, iPhone 6, iPhone 6s, iPhone SE, and iPhone 7 Plus SIM-free and appreciate the options to use them on my choice of cellular networks. Now what if you want to buy and unlocked iPhone 8 or iPhone 8 Plus but don’t want to buy it from Apple? Your best option is to buy the full price Verizon model. That phone is also unlocked. If you want to use it with the Sprint network or a prepaid wireless company that uses the Verizon network you will still need to check the serial number of your phone to make sure it is eligible to be activated on their network. You best option to buy the full priced Verizon model other than Apple is Best Buy. Just make sure you understand the return policy in case you have a problem activating the phone. Most Verizon stores and resellers will not sell you the full price phone if you are not activating a new phone line or transferring an existing one. Verizon like all the other carriers are only interested in selling phones to their customers, not people looking to use the phone’s with other wireless providers. Best Buy in my experience does sell full price carrier model phone without activation. What about you? Are you going to buy the SIM-Free iPhone 8 or iPhone 8 Plus? Leave a reply below and share. I would prefer to pay full price, Bob. But since I am truly an iphone fan, I put them on my AT&T plan where I have the REST of my family’s lines, then I pay off early as I can. At that time I take my iphone (already GSM), have AT&T unlock it (they do if it is paid for without any difficulty) and go with tracfone. I really like it for my needs. I’m want to buy a new iPhone but I’m stuck on buying unlocked or T-Mobile version. Is there any T-Mobile service software loaded on the T-Mobile version in addition to the operating system. No. Apple doesn’t let any carrier preload or alter iOS on their version on the iPhone. I am a current straight talk costumer and am using my iPhone 6 with an AT&T compatible sim. I am thinking of buying the iPhone 10 sim free version(when or if it is available). Do you know if I would just be able to transfer my existing sim to the new iPhone 10? Yes. You can just move the SIM, both phones use a nano SIM. I talked about the SIM-free model here and see my YouTube video and the comments. Why don’t you buy one?